It’s your worst nightmare. The blue lights swirl in the glare of your rear view mirror. Your heart sinks. Your mind races. You try to remember how many beers you had. Prescription medication might be a factor. The officers walk up to your window. What happens now? What are your options? What are you supposed to do? How will this affect your future? These are all complex questions need answers from Gulfport defense attorney Rufus Alldredge. Driving Under the Influence (DUI) is a serious misdemeanor. In Mississippi it is illegal to drive a car, truck, or any motor vehicle while under the influence of alcohol or any other substance. What does “under the influence” mean? Police typically try to determine whether a person is under the influence by measuring levels of alcohol or drugs in a person’s breath, blood, or urine. Blood or urine tests can detect the presence of opiates, cocaine, Xanax, marijuana, prescription medication, or street drugs. Field sobriety tests and the officer’s observations can also be evidence. In Mississippi, it per se illegal to drive a car, truck, or motorcycle with an alcohol level of .08% or more. Mississippi DUI law applies to all motorized vehicles, even four wheelers. The Mississippi alcohol limit is .04% for the operation of a commercial vehicle, if the charge is brought under Mississippi DUI law. Different rules apply to commercial driving licenses (CDL) issued under the Federal Motor Carrier Act. Minors under 21 years old are subject to the zero tolerance threshold of less than .02% alcohol. In Mississippi, it is unlawful to drive under the influence of any substance, including drugs. Drugged driving cases are getting more publicity. Prescription medications, marijuana, opiates, methamphetamine, spice, bath salts, and even over the counter substances such as antihistamines are now targeted for DUI drugged driving enforcement. Mississippi DUI officers are trained to apply for a search warrant to obtain the driver’s blood which is sent to the Mississippi Crime Lab. Both qualitative and quantitative analysis can be performed by the Mississippi Crime Lab and reported to the prosecution for use in court. Investigating a drugged driving DUI charge is different from an alcohol DUI charge. However, regardless whether the substance is drugs or alcohol, the conviction is the same. In Mississippi, a first offense DUI conviction is punished by possible jail time, fine, and completion of the Mississippi Alcohol Safety Education Program (MASEP). First offense conviction for DUI may also require attendance of the Victim Impact Panel (VIP) of MADD (Mothers Against Drunk Driving). The minimum driving license suspension is 120 days minimum if MASEP is completed. Under certain limited circumstances, a first offense DUI charge may be non adjudicated. Whether the driver receives the benefit of non adjudication is in the discretion of the court and depends on the facts and circumstances surrounding the charge. Out of state visitors including tourists, casino patrons, or military may also be eligible for non adjudication. Adults and minors under 21 maybe eligible for non adjudication. The best Mississippi DUI attorneys will try to make non adjudication available on your case. Non adjudication means you do not get convicted and the DUI stays off your driving and insurance record. In Mississippi, a second offense DUI conviction carries mandatory jail time up to one year. The courts will look back 5 years to determine if the charge is a second offense. A person convicted of a second offense DUI must receive an in-depth diagnostic assessment for substance abuse and chemical dependancy. In Mississippi, a third offense DUI conviction within 5 years is a felony and can result in mandatory prison time from 1 to 5 years. The minimum prison time will not be suspended. Other requirements include a fine, alcohol assessment, community service, and a driving license suspension for 5 years. In some cases part of the sentence may be served on house arrest. Mississippi’s new lifetime fourth offense DUI law was enacted in response to publicity, news reports, and public pressure concerning serious DUI cases. Sometimes hard facts make bad law. A fourth DUI conviction in the driver’s entire lifetime is a serious felony. Fourth offense DUI carries up to ten years in prison, hefty fines, lengthy license suspension, and other consequences. Mississippi law prohibits driving under the influence (DUI). Neighboring states may use the term driving while intoxicated (DWI). Other states have terms such as operating under the influence (OUI) or even operating while intoxicated (OWI). Regardless of what the charge is called, Mississippi courts recognize convictions from other states in determining whether to charge a DUI as a first, second, third, or fourth offense. In Mississippi, a DUI causing death or serious injury in a negligent manner is a felony and can lead to 5 to 25 years in prison for each death or serious injury. Sentencing for multiple deaths may be imposed consecutively in the discretion of the court, meaning a court can stack sentences on top of one another. Another consequence of a DUI conviction is the driver’s license suspension. In such a mobile world, we are accustomed to jumping in a car and driving where we want to go. Losing a driver’s license can affect how you get to where you need to go. The consequences of a DUI can be life-altering. In Mississippi, if you drive on a public road, you are, in the eyes of the law, giving your consent to a chemical test of breath, blood, or urine. Refusal of the test can result in driver’s license suspension of 120 days for a first offense, and one year for second offense DUI refusal. This suspension is in addition to any other suspensions or penalties, even if the driver is later found not guilty. An out of state motorist will face the above suspension of his privilege to drive in Mississippi. Any of suspension of an out of state driver’s license will be governed by the laws of the home state. After a DUI first offense conviction, the minimum criminal driving license suspension is 120 days. Mississippi driving license reinstatement requires completion of Mississippi Alcohol Safety Education Program (MASEP), and payment of the reinstatement fee. Upon conviction of DUI second offense or greater, Mississippi law requires an alcohol assessment for substance abuse and chemical dependancy and treatment if indicated by a facility certified by the State Department of Mental Health. Successful completion can reduce driving license suspension. Mississippi has eliminated hardship driving licenses after DUI convictions. However, Mississippi residents may be eligible to obtain a restricted driving license and have the ignition interlock installed. Also called the blow-and-go machine, it records a photograph of the operator and a breath sample before starting the vehicle. When a driver on a public road refuses the test of breath, blood, or urine, a suspension letter will be sent. The driver has 10 days from the date of the letter to file a lawsuit against the Commissioner of Public Safety, in order to contest the suspension and request a hearing. There are many procedural issues that you need to be aware of if you seek to contest the suspension of your license. For example, you should be sure to save the letter and the envelope with the postmark intact as it may give you extra time to file. Navigating these numerous issues is more effective with a lawyer. A non-resident driver who refuses the test will receive a suspension of his privilege to drive in Mississippi. The suspension for test refusal will also be reported to the Driver License Compact. Any felony or misdemeanor drug conviction, including paraphernalia, carries a 6 month suspension of the driving license or privilege. This suspension also applies to out of state drivers. The suspension will be reported to the Driver License Compact. There are numerous issues that can arise regarding a DUI charge or conviction. 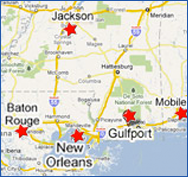 If you are facing a DUI in Mississippi, call us. We will help you navigate these troubled waters. Call Gulfport defense lawyer Rufus Alldredge at 228-863-0123. We are located at 1921 22nd Avenue in Gulfport, Mississippi.